Jon and I are excited to announce that we will have freeze beef available very soon. Some of the steers are already spoken so now is the time to reserve your beef by contacting Jon or myself. 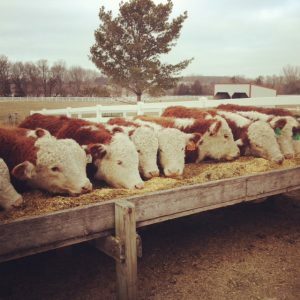 All of our beef is processed through Edgewood Locker. Processing charges can vary per animal and can increase with the more packaging or speciality items you do such as beef sticks, beef patties or beef in gravy. (We personally love these three products because of the convenience. Plus, Edgewood’s beef sticks are fantastic.) To give you an idea we had two customers last year that did a lot of processing and paid just over $200 for their quarter and $380 for their half beef. If you need help deciding how your animal should be processed (thickness of steaks, how many roasts should you get, etc.) will would be more than willing to lend a hand.